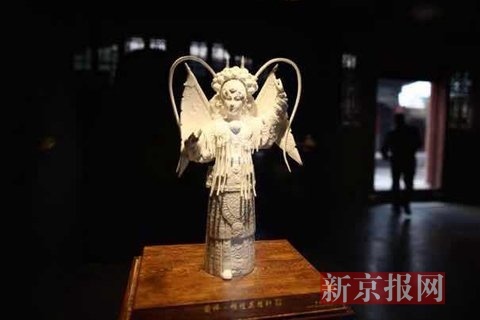 The exhibition, The Glamour of China White - Dehua Ceramics, co-hosted by the Palace Museum and Dehua County government, opened at the Hall for Abstinence of the Palace Museum on Oct 30. One hundred and twenty-two pieces of Dehua ceramics will be on display for one month. Dehua Kiln in Fujian province is home to ceramic white ware, which is famous for its smooth glazed color and highly acclaimed by foreigners as “China White”. It was exported to foreign countries via the Maritime Silk Road in the Song and Yuan dynasties and collected by European royal courts and nobles. Dehua Kiln is expert in sculpture ceramics, especially Taoism and Buddhism figurines whose facial expressions are elaborately portrayed. For these reasons, Dehua ceramic culture plays an important role in the history of Chinese ceramic culture. The Palace Museum has collected more than 700 pieces of Dehua ceramics, among which more than 200 pieces date back to the Ming Dynasty. The ceramic works displayed in the exhibition include 20 Palace Museum collectables from the Ming and Qing dynasties as well as 102 pieces of modern Dehua ceramics. The exhibition features ceramic white ware. The blue-and-white porcelain and red glaze porcelain works are also in the show. The themes of the exhibits vary, from figures and landscapes to flowers and animals. To help ceramics lovers learn more about the exhibits, the Palace Museum has published an album of Duhua ceramics. A symposium on Dehua ceramics was held in the Palace Museum on the same day. More than 30 experts and scholars from Academy of Arts and Design at Tsinghua University, the Chinese National Academy of Arts, Quanzhou Museum of Fujian province, Dehua Ceramics Museum and the Palace Museum attended the symposium and delivered speeches on Dehua ceramics.